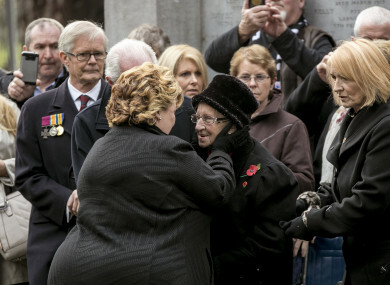 Fionnuala Jay-O'Boyle CBE, Lord Lieutenant of Belfast greets Nellie O’ Donnell (nee Duffy) daughter of Irish Victoria Cross recipient, James Duffy before they unveiled her father's memorial stone. IRISH SOLDIERS WHO fought and died in World War I have been honoured in today’s Armistice Day commemorations at Glasnevin Cemetery. The event was marked by the laying of wreaths at the France-Ireland memorial and Cross of Sacrifice to remember the thousands of Irish men and women who died fighting in World War One and World War Two. This was followed by the unveiling of Victoria Cross Commemorative Stones in honour of four Irish men who received the Victoria Cross for their acts of bravery in World War One. The commemorative stones unveiled at the ceremony were in honour of John Moyney VC (Irish Guards), Clement Robertson VC (Tank Corps), James Emerson VC (Royal Inniskilling Fusiliers) and James Duffy VC (Royal Inniskilling Fusiliers). “This year’s Armistice Day commemoration in Glasnevin Cemetery provides us with a special opportunity to remember and pay tribute to the men and women from across the island of Ireland, who served and gave their lives during World War I. Around 30,000 Irish people died in World War I – almost 1% of the country’s population at the time. “Whatever their background or beliefs, they confronted the horrors of war and the bitterness of conflict. The recent joint centenary commemoration of the Battle of Messines in 1917 was but the latest example of the inclusive way in which we are addressing our shared history with respect and inclusiveness. It is a particular honour to help unveil four new VC stones in memory of some of the heroes of World War One in the presence of some of their relatives. The commemoration concluded with the unveiling of a commemorative plaque describing the France-Ireland Memorial in the Glasnevin Cemetery Museum building by His Excellency Stéphane Crouzat, Ambassador of France to Ireland. The plaque will be added to the France-Ireland Memorial. Email “Irish dead of World War I and II honoured at Glasnevin Cemetery”. Feedback on “Irish dead of World War I and II honoured at Glasnevin Cemetery”.